If you are logging on from somewhere in Australia you will probably know us already as Australia’s most comprehensive specialist importer, wholesaler, and retailer of authentic Native American jewellery, Native American arts and Native American crafts. If you are visiting from elsewhere, take some time to have a look around. We have made an effort to make our new home in cyberspace as easy to navigate and user-friendly as possible  you will find many unusual items featured in our gallery, reflecting a life-long passion inspired by these diverse and vibrant cultures. 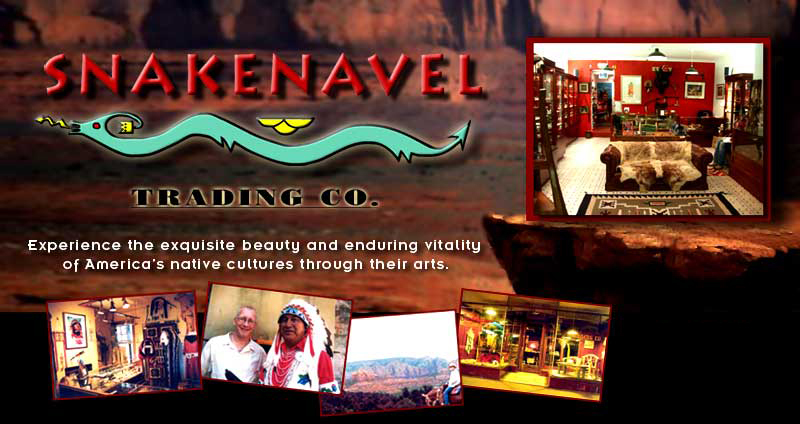 Established in 1990, Snakenavel Trading Company represents, at any one time, more than two dozen different tribal groups, and, as committed members of the INDIAN ARTS AND CRAFTS ASSOCIATION we are pledged to honest representation of merchandise. 15 years of experience in the business and, above all, a commitment to authenticity coupled with a 100% guarantee of satisfaction, will assure of our integrity. For many years we were located at the Rocks in Sydney where, in 1996, we had merged with Native American jewellery specialist, the “Cowboy from Downunder” (estd. 1981). With the goal of consolidating the business and concentrating on our internet presence we decided to close our high street store in February 2005, however, we do retain a physical showroom which will be open by appointment. It was a visit to the Hayward Gallery in London for the 1976 exhibition, Sacred Circles that confirmed to proprietor Mark Lucas that there was more to Native American culture than Western movie clichés and the romantic shaman stereotype promoted by the “New Age”. Some dozen years of informal research & collecting passed before disenchantment with a corporate career, together with a road-trip across the South-West led to the establishment of the gallery. Since 1989 Mark has travelled to the US many times and covered many thousands of miles seeking out the best sources of American Native art. As time goes on, and in line with what works for you: collectors and casual buyers alike, we will expand on our inventory. If there is something special you’re after please do not hesitate to enquire…we’re bound to know someone who can help if we can’t ourselves. We deal as directly as is practicable with the artisans whose work we represent and are pledged by membership of the Indian Arts & Crafts Association to honest representation of merchandise, backed by our 100% satisfaction guarantee. Many of these individual craftspeople supplement their normal income through their art, some rely on it to feed their families, and all make a tangible living contribution to the continuance of tradition in their community. Hopi Kachina dolls, Navajo folk art, Zuni fetish carvings. From the Plains Headdresses, buckskins, beadwork, parfleche, shields, rattles, hide paintings, dolls. Pacific Northwest carved wood masks, rattles, totems and wall plaques as well as exquisite silver-work. Plus drums, blankets, quilled baskets, fine art and more.